Vertical shaft sinking projects are complex and highly challenging, therefore requiring a lot of experience. Usually, a drum winch for passenger and/or material transport (cage and/or bucket) and a drum winch for lifting and lowering the working platform (Galloway) are used. The hoist ropes of the working platform are often also the guide ropes for the cage or bucket. EVOLUTION QS816V is a high performance hoist rope from TEUFELBERGER which impresses with its high breaking forces and its radial stability. Since the hoist ropes of the working platform are installed in combination with swivels (which allow the free movement of the working platform), it is necessary to use only rotation resistant ropes. When transporting passengers and/or materials, care should also be taken that the properties of the rope address the specific challenges of the application. Your TEUFELBERGER mining team will support and advise you when it comes to selecting the right rope for your next shaft sinking project. 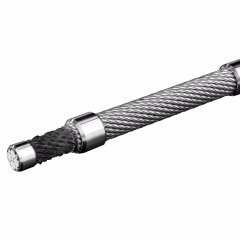 The hoist rope for shaft sinking in our portfolio is NOROTEC® MT 91. 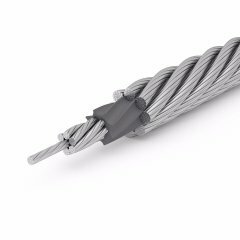 Of course, this hoist rope from TEUFELBERGER can be delivered with different coatings and rope end terminations.